Now that was a delicious burger. Pineapple, bacon, blue cheese, cilantro sour cream... it was delicious! And the bun was also delicious. I was afraid it would be really messy, but it was all contained nicely on the bun. Yum. Fries were pretty good, a bit soggy though. I tried one of their angus burgers for the first time this week. I had grilled onions, mushrooms, jalapenos, and chipotle ketchup as toppers. The meat was lean and toppers were fantastic. I saw they are back in our area, so I will be indulging again today! Miami Vice Burgers serves in Arlington, VA. Burgers are on the menu. 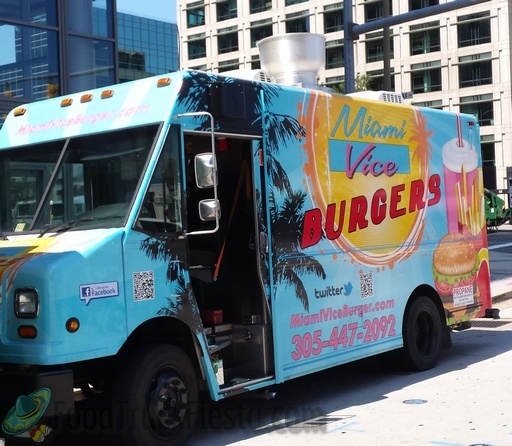 Many thanks to FTF fan, Richard, for the initial tip and photos + Miamiviceburger for the follow-up!